"Brewing with fresh hops is a big endeavor, requiring four to five times the hop volume compared to using pelletized hops. Although the process is complex, it brings impressive results: Fresh Hop is an American-style pale ale with moderate hop bitterness marked by a unique and intensely grassy hop flavor and aroma. 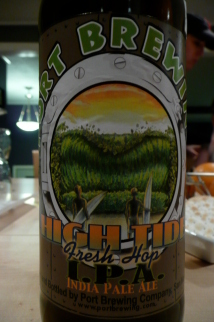 Fresh Hop is a superbly refreshing, medium bodied, light-copper colored pale ale weighing in at 55 IBUs and 6.1% ABV." -- Great Divide Brewing Co. The Fresh Hop Pale Ale pours a dark amber color and settles into a medium amber body. The medium fizzy off-white head was mostly diminishing with excellent lacing. The nose detected a strong hop presence with notes of pine and wet grass. The harsh initial bitter taste lasted for quite sometime moving into a moderately bitter taste on the palate for an tremendously long duration. Creamy with soft carbonation and lively carbonation, the Fresh Hop Pale Ale had a strong presence of hops. This pale ale stands above the crowd with it's strong hop presence. It's not a well balanced beer, but the hoppiness packs a strong bitter punch. It's smells delicious - Ian. For non hop heads, stay away and let us enjoy this special brew - Sean.